EIt is the closest town to the National Park of Machu Picchu and the place of the last train station. Aguas Calientes is the city at the bottom of the valley below Machu Picchu, also known as Machu Picchu Pueblo, but the name of Aguas Calientes, receives it because at the back of the town, in a small nook of the mountain, you can find “hot springs”, or rather, thermo-medicinal waters. Aguas Calientes, is virtually an island, separated from all roads, surrounded by mountains, cliffs, rivers and an impressive cloud forest. Once you are in this small town you will be just minutes from the entrance to Machu Picchu. You can choose to walk up, but we recommend boarding the buses to Machu Picchu; The best of Aguas Calientes is on top, between the Machu Picchu and Huayna Picchu mountains. Important: Spend the night in Aguas Calientes offers a clear advantage, you can be in the entrance to Machu Picchu very early, and this is a very good reason to stay. It can be the first people to board the buses, to arrive and be in Machu Picchu. 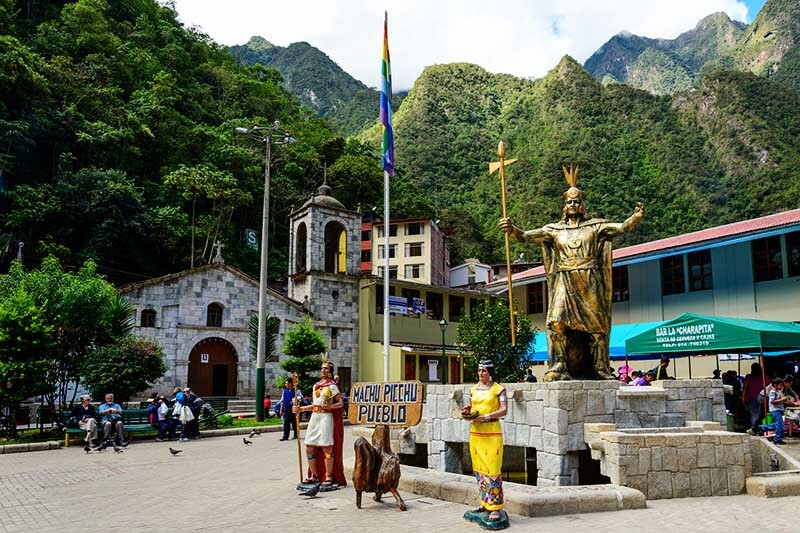 Every day, thousands of people from all over the world come to the town of Aguas Calientes in search of the wonder of Machu Picchu . This mixture of ideas, cultures, nationalities, religions, etc., has turned this small town into one of the most cosmopolitan places in the world. To get to Aguas Calientes you will have to reach the city of Cusco, in this place you will board a bus to the town of Ollantaytambo; Here is the main station to board the trains to Machu Picchu. If you have time available before boarding the train to Machu Picchu, tour the ancient Inca town of Ollantaytambo, it is one of the most mysterious places on the planet. 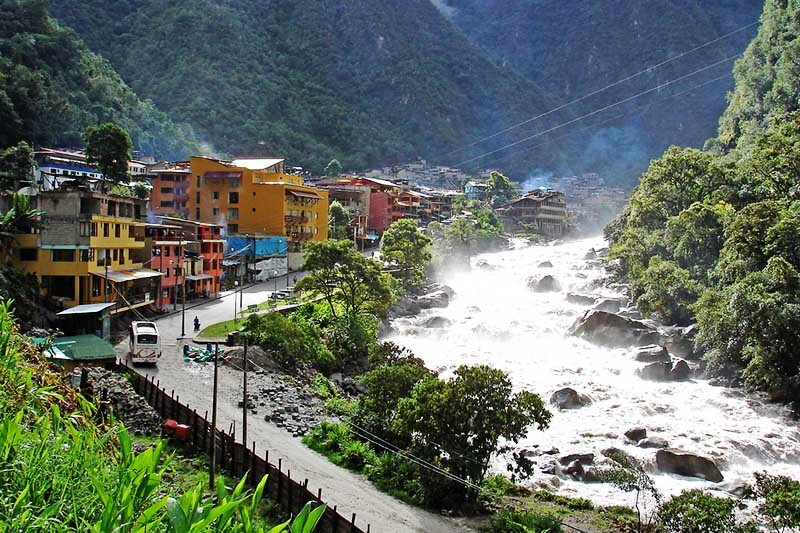 What to do in Aguas Calientes? Unless you let us take care of all the tickets you will need on your trip to Machu Picchu, you will have to make a large queue to buy bus tickets from Aguas Calientes to Machu Picchu; The ticket office is very close to the train station. The buses leave every 15 minutes, from 5:30 am..
Aguas Calientes has an enormous variety of restaurants; after the train and arriving at the hotel, your nose will take you to one of the hundreds of restaurants in Aguas Calientes. You will find typical Cusco food, typical Peruvian food, such as “pollo a la brasa”, baked chicken, fried trout, but also food restaurants, Italian, Chinese, Spanish and others; in addition, the fusion of these with Peruvian dishes and ingredients. Remember that you are in Peru, the best culinary destination in the world. As for drinks, there are dozens of bars all over the town, just choose one and try the “pisco sour”, Peruvian drink, a glass of this delicious cocktail based on pisco can take you to a night of unrivalled frenzy without equal. He prefers a non-alcoholic drink, enjoy the chicha morada, it is another of the flag drinks in Peru, it is made with a concentrate of purple corn, mixed with lemon and cinnamon. Relax in the hot springs of Aguas Calientes; you can do it after visiting the Inca city of Machu Picchu; we recommend it even more, if your ticket Machu Picchu includes some of the mountains of Machu Picchu or if you enter by the Inca road, your body will ask you to relax, and you will not find better place than the hot springs of Machu Picchu. You can find massage centers, but a more interesting alternative to relax in Aguas Calientes is to travel the town in search of those unique places to take pictures or to make new friends. The ” The butterfly house” is one of the best places to visit as a family, especially if it comes with small children, it is 15 minutes from the town (1.1 km) walking. This living museum houses the species of butterflies that you can see in Machu Picchu, some of them can only be seen in this place. The butterfly house opened its doors in 2006 and in it, experts and volunteers study and preserve the butterfly species of Machu Picchu. You will see hundreds of butterflies flying freely. ← Is it safe to buy the Ticket Machu Picchu online?